Have you been to the dentist this year? Have you been avoiding going to the dentist because you don’t have dental insurance? Do you know someone who has a tooth that has been bothering them? Good news! 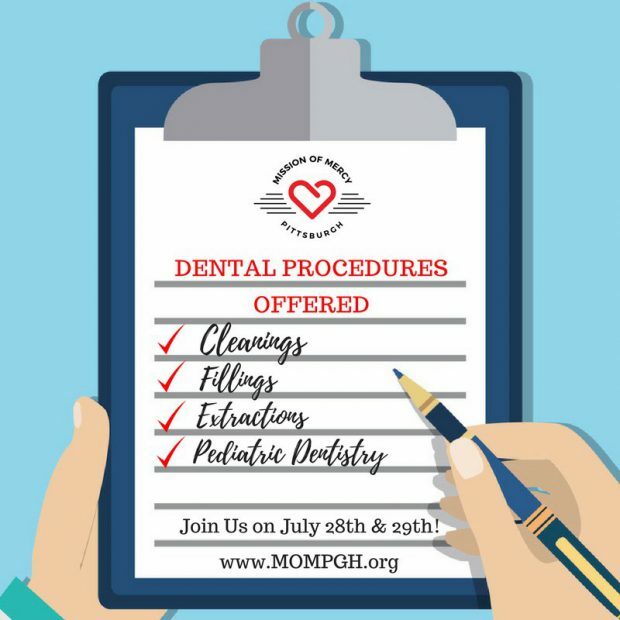 There is a FREE, totally free, dental clinic this Friday & Saturday (July 28 & 29, 2017) in Pittsburgh at the AJ Palumbo Center. Take it from me, you need to go to the dentist. I skipped those cleanings for a few years and ended up with a broken tooth, a lot of pain and a lot of expense. Not only can tooth pain be very painful, but it can impact your overall health. (Check out this fascinating article from Men’s Health about root canals and heart health). Please visit the Missions of Mercy patient info webpage for a complete FAQ for patients. Who is behind the free dental clinic? Michael Zamagias, CEO of Teletracking Technologies Inc.
You wouldn’t expect someone needing dental care to land in the hospital emergency room. But that scenario has played out nearly 3,000 times at UPMC hospitals in the Pittsburgh area in the last year.